CROWNWeb is a web-based data-collection system that has shifted how Medicare-certified dialysis and transplantation centers submit important ESRD data to the Centers for Medicare & Medicaid Services (CMS). Facilities use CROWNWeb to report patient treatment summaries, activity reports, CMS forms, monthly clinical data, and more to CMS in real time. Reporting patient data through CROWNWeb helps reduce the time that it takes CMS to gather and analyze data that can be used to develop programs and plans to aid efforts in improving patients’ overall quality of care. AIM 1: Better Care for the Individual through Beneficiary and Family Centered Care. 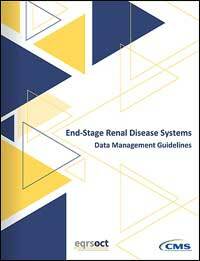 AIM 2: Better Health for the ESRD Population. AIM 3: Reduce Costs of ESRD Care by Improving Care. Data Reporting. Data from 100% of the population is received faster than ever (75% faster), enabling facilities and CMS to better analyze trends and care efforts. Dialysis Facility Compare. CMS uploads facility and treatment data onto the Dialysis Facility Compare (DFC) website to help patients and families make informed healthcare decisions. Treatment History. CROWNWeb stores digital copies of forms and treatment records to provide instant knowledge to facilities of how to best care for an existing patient. Disaster Preparedness. Facilities can help patients locate open treatment centers and ensure that a patient finds a suitable location for treatment in the event of a natural or human-caused disaster. 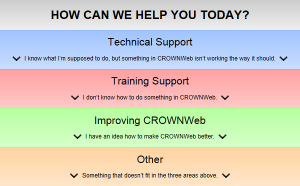 Please visit the CROWNWeb Help System if you have questions regarding CROWNWeb’s data collection capabilities and the benefits it offers the ESRD beneficiary community.